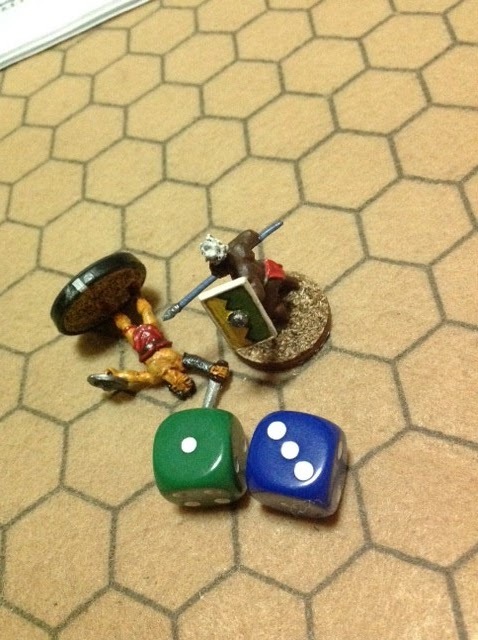 Macer was happy to the extent that his theory of minimal injuries was correct, but he was not sure whether the merchant enjoyed such a one sided match up. He did however think the concept worthwhile to persist with. Strangely, Isaac claimed that he did not put up a fight in the end as was converting to a new cult which extolls him to love his brother and turn the other cheek. Macer laughed this off, calling him a dullard. Kemsa gains 1 gold as reward, bringing his savings up to 8 gold, along with extra rations of turnips and wine. Kemsa was left wondering whether he was truly superior as a boxer, or whether Isaac threw the fight. The editor of the games, who has previously been unnamed, is actually the city Magistrate, Lucius Septimus Geta. 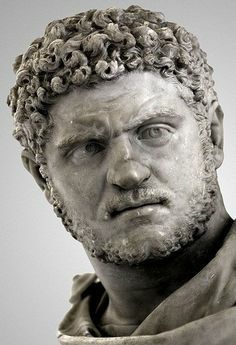 He is from a distinguished and wealthy family of the Roman Equestrian rank, and a major political force in Leptis Magna. Though typically, Macer has scant regard for Geta, especially as Geta is good friends with Noctua. Geta summoned Macer to a meeting to discuss the upcoming games. Macer was advised due to financial constraints, the scale of the games has been reduced, and there is no room for Macers gladiators to participate. He did however say that the governor has declared games in the city of Hadrumentum to the west, dedicated to the goddess Edesia. The games are designed to appease the angry populace there, but as the Governor is too stingy to pay, all participating ludus’s are donating their gladiators for free. There will be compensation only if there is a death. Macer protested “What? No reward? Shouldn’t Noctua go instead?”. Geta grew angry, “I have put forward the ludus of Macer to represent Leptis Magna! If you do not do your civic duty, you will be excluded from the Festival of Liber Pater!”* Grudgingly, Macer agreed to go. “This is Noctua’s doing!” he thought to himself, “All because I didn’t sell him Mago!”. The wagons, provisions and gladiators took to the road. Upon arriving in Hadramentum, the following match ups have been declared: Mago vs Seleucos who has 2 skills (Dodge and Attack) , Kemsa vs Porphyry who has 2 skills (Attack and Reflexes). Mago’s opponent is of lower skill (so no experience from the win), whilst Kemsa’s is equal (so he will get experience). There are no winnings to be earned, so a risky affair. Though for the first time Mago and Kemsa will have the Governor in attendance. * The festival of Liber Pater is THE major event in Leptis Magna. It is a festival of wine, freedom, and intoxication (equivalent of the Bacchanalia). It seems Seleucos is considered an up-and-coming fighter in Hadramentum, which is why he had been picked to take on Mago. As the fight got under way both gladiators circled each other cautiously at first, neither was willing to make the first move to contact. 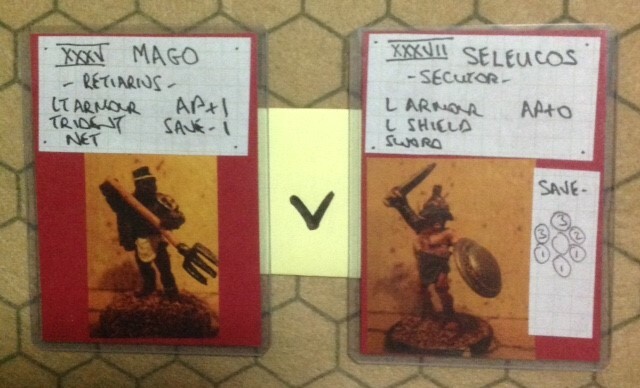 Eventually Mago saw an opening but his attack was parried by Seleucos and Mago acquired a fatigue. Mago continued to take the initiative though, and for several rounds he deliberately spent more than 6AP (he has D6+2 potentially) to try and get in a side attack, but to no avail, except that his fatigue began to mount. Then at last he was able to entangle Seleucos, and shortly afterwards knock him down (double 2 but not able to end his move adjacent). From then on Seleucos was not able to get back to his feet - he would need to throw more than 4AP to do this, 1 to counteract the entanglement and 3 to equal his front-hex defence save modifier. He could not score the needed 5AP, nor could he cut free from the net. Mago took several moves to finish him off, as Seleucos cleverly rolled and crawled to avoid the trident, but inevitably he succumbed in the end. The crowd spared him. Seleucos: lost 8/8 strength, 1 fatigue, Missio (Lost but given Mercy). As the crowd discussed this fight afterwards, it was generally agreed that either Kemsa is the dumb-luckiest gladiator of recent times, or a tactical genius. No-one is sure which. He and Porphyry did not waste any time coming to blows, and Porphyry soon scored what seemed to be a winning blow, taking 4AP off Kemsa, who was unable to hit back effectively at his more nimble opponent. It was not looking good for Macer's boy wonder. Even when Porpyhry tripped and fell in his own turn (double 3 special event) Kemsa was unable to turn it to his advantage, instead building up more fatigue. He was actually coming quite close to being exhausted. Porphyry withdrew from the fight for a couple of moves, reducing his own fatigue level, but Kemsa kept moving after him, so his own fatigue level stayed dangerously high. Watching from the sidelines Macer vowed to sell Dahia so no more tiring distractions there, and saving on turnip rations too. But then Fortuna started to smile again. It seemed Kemsa's tactic of keeping in touch with his opponent was paying off. Kemsa knocked Porpyhry down, and was able to land some good hits (including a shield bash) before he could get up again, taking him down to his red strength tokens. 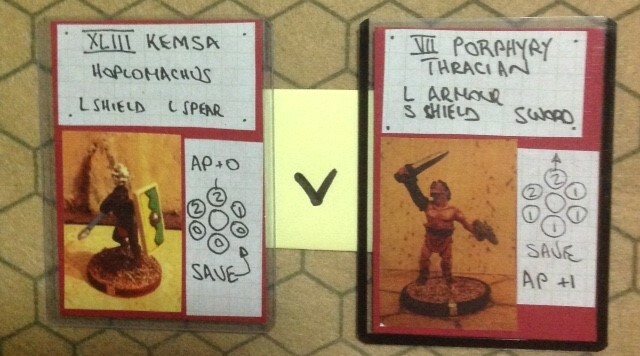 Finally, in a last attack, Kemsa broke through Porpyhry's defences and delivered a massive 6AP fatal blow. The photo is a staged shot, but it gives the idea! Kemsa: lost 4/10 strength, 4 fatigue, Vincit (Won). Porpyhry: lost 11/8 strength, 1 fatigue, Peruit (Killed).